The SFMTA said the lanes will help speed up the commute for buses and taxis. 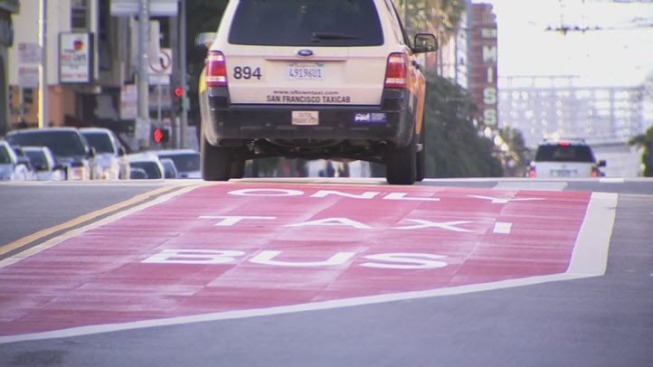 New red transit lanes in San Francisco's Mission District are causing confusion for drivers. "I know myself, I've just been a little startled by it," Bernal Heights-resident Caroline Hill said. Hill and other drives are adjusting to the new red transit lanes. The lanes -- designated only for buses and taxis -- are part of the 14 Mission Rapid Project approved by the San Francisco Municipal Transportation Agency's Board of Directors in December. The transit lanes run along Mission Street between 11th and Randall. The SFMTA said the lanes will help speed up the commute for buses and taxis. "It will make our buses have exclusive use and it will have the benefit of reducing travel time," said John Haley with the SFMTA. But longtime resident Roberto Hernandez said the changes force drivers to make right turns where they did not have to prior to the new lanes being installed. "People are getting late to work. Children are getting late to school," Hernandez said. SFMTA officials said they hear the complaints from residents and motorists, and are planning to make adjustments. "We've looked at signal timing and we've given some better signage," Haley said. "We've put some additional striping in the street." The project is still under construction with just a few blocks left to go. The SFMTA hopes to complete the project next week.